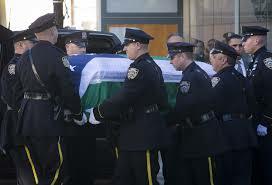 Did you hear about the 2 police officers who were killed in New York City on 20th December, 2014. Here is a part of the story which you probably didn’t hear on CNN. Rafael Ramos, one of the murdered officers, was a Christian. A member of Christ Tabernacle Church in Queens, New York for 14 years, he was a committed believer. According to his pastor, Rev. Adam Durso, he served as an usher and was active in the church’s marriage and life group ministries. The Lord God took the man and put him in the Garden of Eden to work it and take care of it (Gen 2:15). Through it mankind would fulfill the mandate given to him by God to subdue the earth (cf. Gen. 1:28). Humanity is to serve God through their various callings. Paul’s encouragement is for us to do everything heartily as to the Lord (Col. 3:23,24), be it law enforcement, sales or agriculture. All are ways in which we bring Him glory.